DRISCOLL BABCOCK GALLERIES presents Don Nice: The Presence of Emblems, a selection of works from the master chronicler of American popular culture objects. Nice’s new single image paintings include images of beer cans, sneakers, Ray Bans and color crayons, exploring the impressive and noteworthy markers of our collective material culture. These works build on his early abstract expressionist brushwork and coloration, carefully cultivated to articulate his interest in quotidian elements of everyday life. In Nice’s paintings the everyday becomes monumental, the disposable becomes iconic and American consumer culture is served up for millennial eyes. 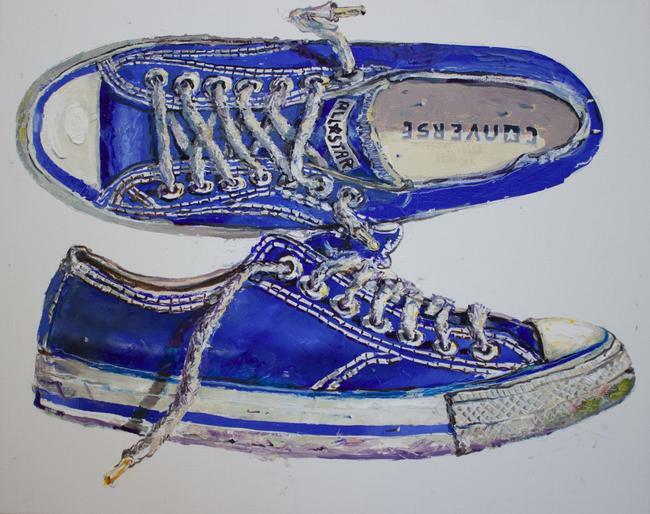 Nice’s tongue-in-cheek approach turns Chuck Taylor sneakers into totems that reveal a narrative, and articulate the artist’s keen interest in the recognition of symbols and their compelling power. Beyond the surface, these objects we encounter every day suggest a poignant critique of contemporary America and our role in the greater creation of culture. Nice’s icons are presented crumpled and used. 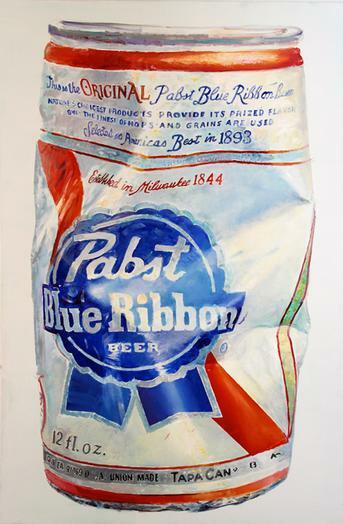 In one example, an iconic red, white and blue Pabst Blue Ribbon beer can is dented and discarded. The resulting irregular angles in the surface allow viewers to examine the object, and its ubiquity in America, through a lens that is both critical and nostalgically wistful. 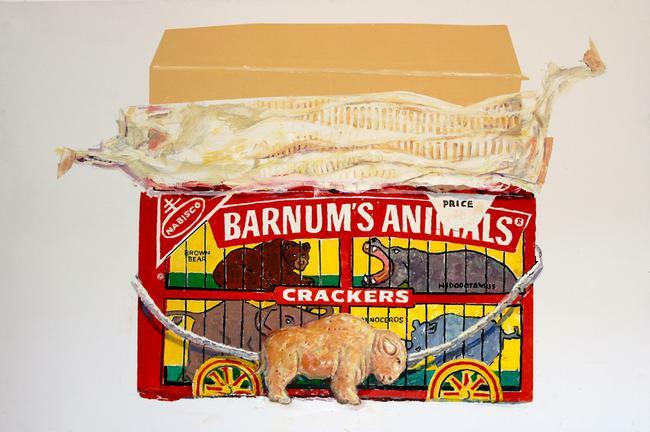 The paintings do not show the clean, crisp and manicured image presented in advertising, but objects that are marked with use, with beauty and poetry in the folds of gum wrappers and translucent plastic packaging. Don Nice takes Edward Hopper’s early mandate for the isolation of objects, and Wayne Thiebaud’s frothy luscious surfaces, and transforms them into his own signature series of images that play with the symbols of contemporary culture, and dig beneath the familiar surface to give presence to that which we usually give little attention. Don Nice is a classic figure in American art of the past half century. He burst upon the scene in the early 1960’s when the Whitney Museum of American Art acquired his “American Series #5” and he was recognized as one of the innovative group of “new perceptual realists” who wanted to put content back into painting. Nice integrates a gestured technique gleaned from earlier expressionist and Abstract Expressionist painters with a realist focus and energy derived from Pop Art. Combining a naturalist’s interest in observation with an artist’s compulsion for artistic vision, Nice embraces aspects of popular culture and certain critical issues of our time. He paints classic American products like sneakers, candy wrappers and soda bottles with the same intensity he lavishes on quintessential site-specific landscapes from the Hudson River Valley to the Sierra Nevada Mountains. In doing so he has created a distinctive vision of civilization’s detritus in league with cultural concerns for the environment. Born in California, he studied art in Europe and earned an MFA at Yale, and then established himself in New York City before acquiring a house and studio overlooking the Hudson River in bucolic Garrison. There he has reveled in the painterly gesture and provocative realism for which he is known. Over the past 50 years Nice’s work has entered many major public collections worldwide including the Metropolitan Museum of Art, the Whitney Museum of Art, the Museum of Modern Art, Arnhems Museum in Holland, Art Gallery of Ontario in Canada and the National Museum of Art in Australia. In 2004 alone, the Metropolitan Museum of Art, the Palmer Museum of Art, the Century Association and the Yale University Art Gallery acquired important examples of Nice’s work; a monograph of the artist’s life and work was published by Pomegranate Books; and the Albany Institute of History and Art organized a major retrospective of the artist’s work.